Writing Systems for the Blind: Who Chooses? As I studied the online Touching the Book exhibition, I was struck by how many of the books were printed in roman embossed types, even those published many decades after the invention of braille. Although Louis Braille published his writing system in 1829, it was not recognized as the official writing system for people who were blind in France until 1854. British educators only began to endorse braille from 1870. An embossing plate in Boston Line Type from 1846. Courtesy of Perkins School for the Blind. In the U.S., embossed writing systems in roman script held sway for even longer than in Britain and Europe. 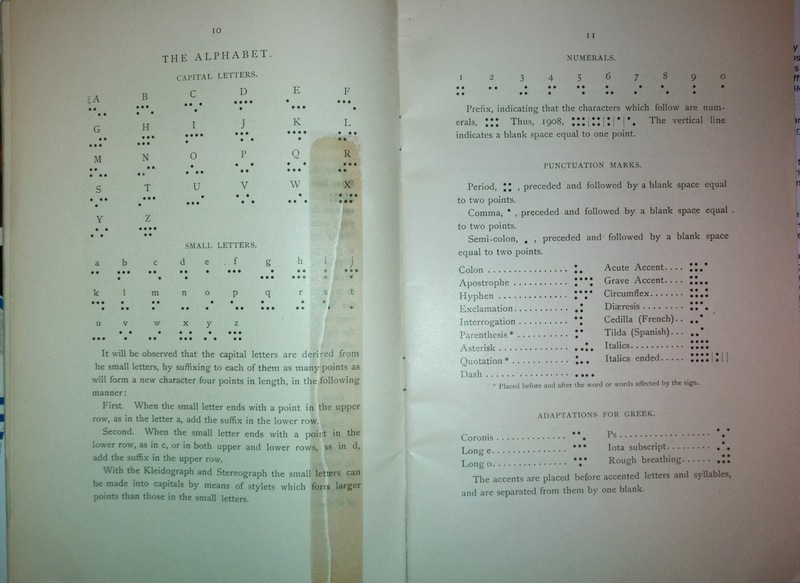 Michael Anagnos was director of Perkins School for the Blind in Massachusetts, and one of the sighted educators who advocated for embossed alphabet writing systems. Nonetheless, in 1877 he wrote of braille, “This system has so many advantages that render it popular among the blind, that they would undoubtedly adopt it in preference to all others, if they were left free to make their own choice.” What accounts for the reluctance to use a writing system that offered elegance, compactness, portability, and perhaps most important of all, the freedom to write? In part, the tenacity of the embossed roman alphabets might be explained by the investment that was poured into them. 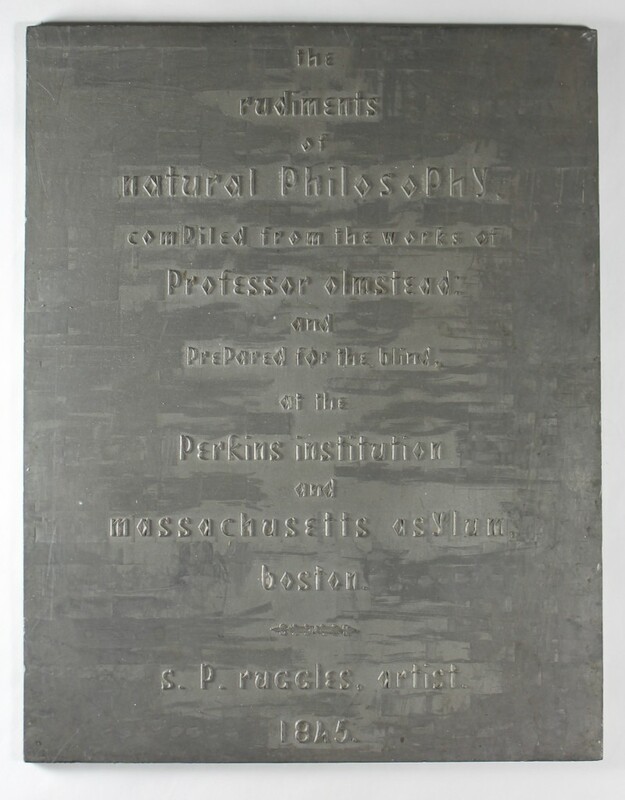 The American Printing House for the Blind was established in Louisville, Kentucky, in 1858 by private backers who were committed to producing tactile books for readers who were blind. Materials in raised letters had been published by a few U.S. schools for the blind for more than 20 years, and the founders of APH did not seem to question the wisdom of continuing this practice. The agency produced materials exclusively in embossed roman alphabets until 1882, and didn’t cease publishing them until the 1920s. In spite of resistance to point systems, their benefits were undeniable. William Bell Wait, head of the New York Institution for the Blind, developed New York Point in 1871, and promoted it among educators prodigiously. In spite of its many drawbacks compared to the braille system, many schools adopted it. In 1882, the American Printing House for the Blind decided to devote half of their book production to New York Point. Given the opinion of educators and the financial investment in non-braille writing systems, how did braille finally win acceptance as the writing system in the U.S.? New York Point alphabet. Courtesy of Perkins School for the Bind. Braille came to the United States in 1860, when the Missouri School for the Blind introduced it into its curriculum. 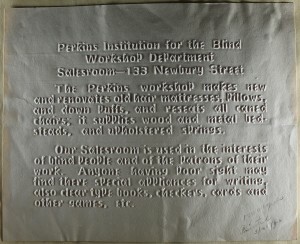 School Superintendent John Sibley wrote, “Children will master the ‘Braille’ in a few days, but many months and sometimes years of hard work result in a failure to learn the ‘Line Letter (embossed alphabet system).’”Perkins was one of the headquarters of resistance to point systems, but only nine years later, the school was selling braille slates alongside its embossed books. How did braille so quickly find a place in an institution that championed Boston Line Type? Although no other school officially adopted braille for decades, and the American Printing House did not produce braille materials until 1893, the system was embraced by pupils at the schools for the blind. 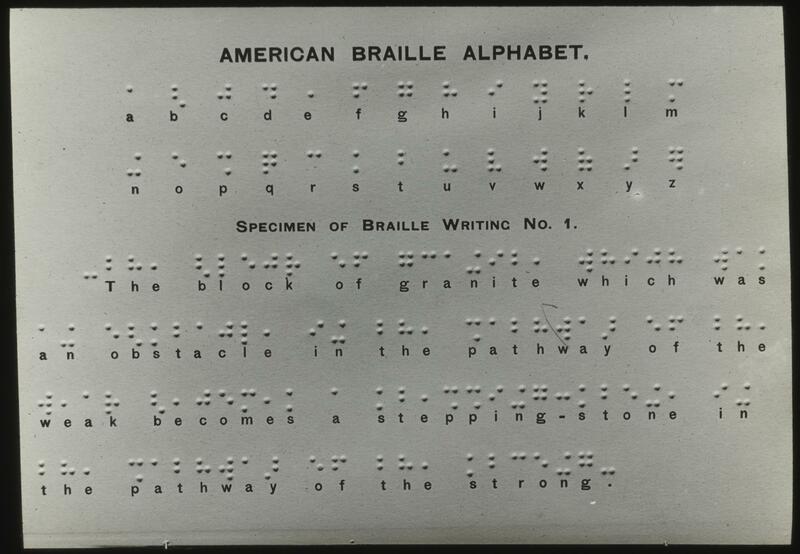 Compelled to read embossed alphabets or New York Point for study, the students were free to use braille for personal correspondence and notetaking (except at the Illinois school, which confiscated braille slates). If their school would not teach them braille, the students apparently taught one another. I like to think that braille spread virally, with the Missouri school as the epicenter. 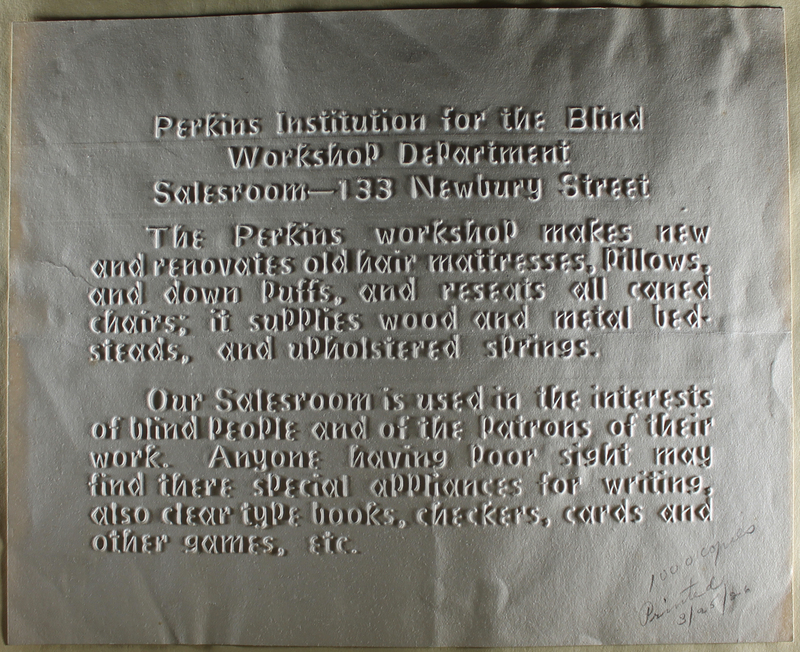 In the mid-1870s, a team of teachers and graduates at Perkins School for The Blind compared all the embossed and point writing systems, determined to identify the best. Braille was the unqualified winner. Perkins director Michael Anagnos wrote of braille, “The scientific ingenuity upon which its construction is based, renders it remarkably simple and methodical; and it is thereby easily acquired and remembered. The arrangement for musical notation is so systematic, so concise, and so comprehensive, that it can scarcely be equalled by any similar contrivance.” Arising from the unequivocal findings of this comparative study, the school added braille into its curriculum for both reading and writing, without dropping its older methods. Unable to leave well enough alone, Anagnos charged a brilliant and inventive teacher to improve upon the original code. Joel W. Smith reassigned the braille cells so that the most frequently used English letters were represented by the cells with the fewest dots. This Modified, or American, braille might have been a bit faster to read and write than Standard braille. Unfortunately, it introduced yet another writing system for students to learn, and another camp of bickering proponents in the increasingly contentious argument about the best writing system for readers who were blind. A flyer in Boston Line Type from c. 1820s. Courtesy of Perkins School for the Blind. In spite of the preference of readers for the clearly superior braille point system, Perkins incomprehensibly continued to publish its books in embossed alphabets for over 30 years more. The American Printing House for the Blind only ceased publishing in New York Point in the 1920s, when schools for the blind stopped teaching it. It was not until 1918 that Standard braille was selected as the official writing system for the U.S. After more than a decade of wrangling and disagreement with educators from Great Britain, a committee of educators settled upon Revised Braille Grade 1-1/2. Nearly 60 years after its introduction into the U.S., braille was finally the official writing system for people who were blind. This success is attributable to its loyal users, who would not give braille up, even when attempts were made to supplant it or even to suppress it. I like to think that this is one of the first milestones in the beginnings of the disability rights movement. Pamela Lorimer, ‘Origins of Braille’, in Braille Into the Next Millennium (Washington, DC: National Library Service for the Blind and Physically Handicapped, and Friends of Libraries for Blind and Physically Handicapped Individuals in North America, 2000), p. 35. Michael Anagnos, ‘Report of the Director’, in Forty-sixth Annual Report of the Trustees of the Perkins Institution and Massachusetts School for the Blind (Boston: Perkins Institution, 1878), p. 70. Carol Brenner Tobe, History in the Making: The Story of the American Printing House for the Blind 1858-2008 (Louisville, KY: Butler Books, 2008), p. 70. Tobe, History in the Making, p. 70. John T. Sibley, The Blind; Their Characteristics and Education: An Address Delivered in the Hall of the House of Representatives, at Jefferson City, Mo., February 26, 1891 (St. Louis, MO: Commercial Printing company, 1891), p. 16. Carol Tobe, ‘Embossed Printing in the United States’, in Braille Into the Next Millennium (Washington, DC: National Library Service for the Blind and Physically Handicapped, and Friends of Libraries for Blind and Physically Handicapped Individuals in North America, 2000), p.46. This entry was posted in Arts on September 18, 2013 by uble293. With their unwieldy, mechanical and ornamented appearance, writing machines for blind and visually impaired people capture the spirit of scientific-technological progress that was so characteristic of nineteenth century society. Not only could machines be used to extract raw materials and make the production of goods and supplies more effective, they could also be applied to social and cultural issues such as the spread of information, the promotion of communication and the improvement of education. Writing machines like the ones on display at the Touching the Book exhibition illustrate this confidence in the civilizing impact of technology. As for the makers of these apparatuses, they won public recognition as philanthropic innovators who worked for the benefit of visually impaired people. Of the two machines exhibited here, only James Hammond’s model from 1902 conforms to what we normally associate with the typewriter. The earlier machine, William Hughes’s Typograph from 1850, was conceived more as a printing device, which could press embossed roman characters on paper. Although Hughes, who was the director of Henshaw’s Blind Asylum in Manchester, intended his machine for private correspondence, he clearly drew inspiration from the kind of machines that were used in printing houses and from the tactile skills of printers. In Edmund C. Johnson’s book Tangible Typography. How the Blind Read, from 1853, the term typograph was also used in conjunction with blindness. Tangible typography referred to the act of reading with one’s fingers. The term tied the different acts of writing and reading to one another in a tactile way. 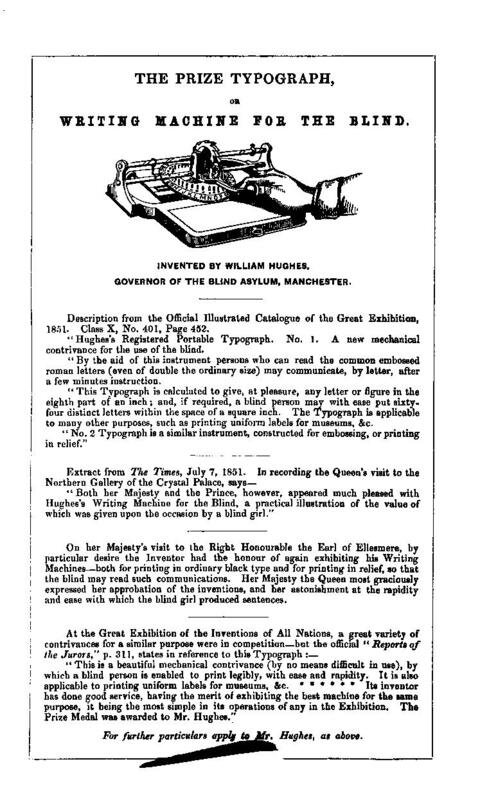 An ad for Hughe’s Typograph, printed at the end of Johnson’s book, describes how this “new mechanical contrivance for the use of the blind”, had been praised for its speed and ease at the Great Exhibition by none other than Queen Victoria. If the Typograph was designed explicitly with the blind in mind, James Hammond’s Braille Typewriter model of 1902 was a modification of an existing typewriter that was adjusted to non-sighted users. With Hammond’s machine we’re well into the period of professional typewriting and competing brands. Hammond was first and foremost an inventor and entrepreneur who, unlike Hughes, had no experience of blind people. The aim of the Hammond 2 braille Typewriter was simply to aid typists with impaired vision to better perform their duties. In this sense, Hammond’s adjusted typewriter was manufactured as a professional tool and not primarily as a device that would make it easier for blind people to correspond with each other. 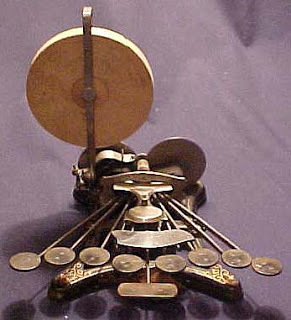 With its braille attachment over the carriage, the Hammond model was indicative of the tension between sighted and non-sighted typing. Skilled typists did not have to look at the keys, let alone at the paper on which they typed. Already in the early days of typewriting there seems to have been an awareness that one could learn to type without looking. In a letter from 1876, the Danish inventor of the writing ball, Rasmus Malling-Hansen, asked his brother to disregard the many spelling errors, which had been caused by the fact that he had not looked at the keys while writing. Another aspect of the typewriter that often was brought up was that it enabled people to work long hours without getting tired. An advertisement for the Remington typewriter recommended weary merchants to switch to typing with the following rhyme: “If writing fatigues you, ‘tis good reason why/You should for your office a Type-Writer buy”. These two features, to write without looking and to write tirelessly for hours, would later become quintessential features of the twentieth century typist. However, in the nineteenth century, the image of the typist was still being formed and blindness and visually impaired people played an important role in how this new technology was perceived. In an article in the occasional journal The Blind, Henry Stainsby from the Institution for the Blind in Birmingham argued that blind people were particularly suited for this new occupation and that they were fully capable of mastering the typewriter. Stainsby was also convinced that it would be a good idea to establish Typewriting offices with blind employees. In a later article in the same journal, he gave a short account of a Typewriting office that had been set up in Birmingham with two blind women employed as operators. Stainsby clearly regarded the typewriter as a new means for the blind to earn a living and as a decent way to integrate them into society on their own terms. A third feature that often was discussed alongside the blind stroke of the keys and the working capacity of the typist was the impressive speed by which things were accomplished with the typewriter. According to Henry Stainsby, blind typists were capable of writing up to 100 words a minute on a good typewriter. The question of how fast a blind person could type was often discussed in connection to the launch of new typewriter models. Typewriters were often displayed and demonstrated at the periodic conferences for teachers of blind and visually impaired people. The conference in Düren 1888 for instance, included a small exhibition of writing machines such as the Bartholomew Stenograph which was presented as a device that enabled the blind to write down spoken words as fast as even a sighted person. As typewriting was established as a new profession the question of how fast one could type became an important employment argument. But speed was not only a quality that resided in the fingers of skilled typists, blind or sighted. With increasingly new models introduced on the market, speed also became an important sales pitch in the marketing of new advanced typewriters. Speed is probably the last thing that comes to one’s mind when confronted with the beautiful collections of typewriters that are kept in museums such as the Musée Valentin Haüy in Paris, the Perkins Museum in Watertown, Massachusetts and the Medical Museion in Copenhagen. It’s difficult to imagine that the blockish keys once were pressed with great speed and precision. For hands accustomed to light computer keys and the flat surface of the mobile display, writing has long since lost touch with the weight and pressure of the early typewriters. This entry was posted in Arts on September 9, 2013 by uble293. p.j.howe on Writing Systems for the Blind: Who Chooses? Noëlle Roy on Writing Systems for the Blind: Who Chooses?